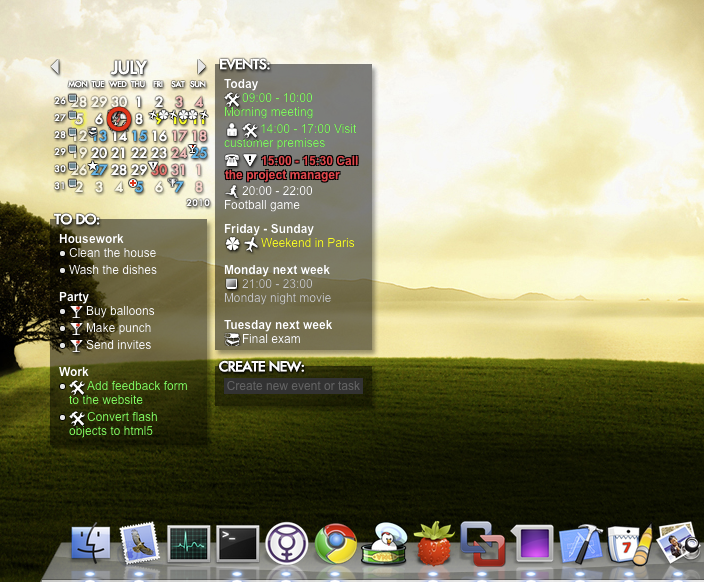 Rainlendar Lite is a feature rich calendar application that is easy to use and doesn't take much space on your desktop. Rainlendar Lite supports events, tasks and alarms. Rainlendar Lite is platform independent so you can run it in Windows, Mac and Linux. The appearance can be customized with skins. Rainlendar Lite is localized to over 50 languages. Rainlendar Lite supports localization so you can use it in your own language. Rainlendar Lite is a unicode application and supports localization so you can use it in your own language. Qweas is providing links to Rainlendar Lite 2.9 as a courtesy, and makes no representations regarding Rainlendar Lite or any other applications or any information related thereto. Any questions, complaints or claims regarding this application Rainlendar Lite 2.9 must be directed to the appropriate software vendor. You may click the publisher link of Rainlendar Lite on the top of this page to get more details about the vendor.